The County library system celebrated its Centennial in 2013 with an exhibit and special events at the Danville Library in November. In the valley’s early years, the only libraries were in private homes, such as the Hemme, Hall, Baldwin, Stone and Wood families. For many, books at homes were a rarity. From 1903-1911 California’s State Library had a Traveling Book Service which loaned 50 books to different communities for three months. The Danville Grange applied for this service in 1906. In 1909, Sister Mary McPherson Podva was appointed a committee of one to obtain these books for Grange members. Early in 1910 Mary More was appointed Assistant Librarian and took charge of the newly arrived books. In 1911 the state legislature enabled counties to establish public library service in unincorporated areas. The Grange endorsed the idea of a County Free Library in 1913. 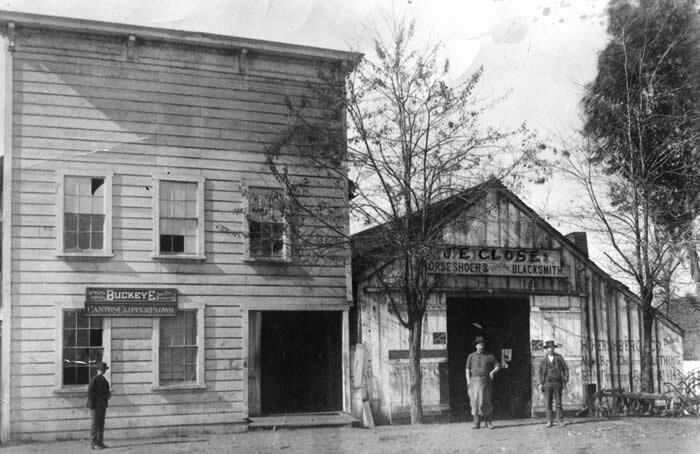 Thus, on November 9, 1913, the Danville Branch of the new county library opened with 104 books. They were available in the Danville Improvement Club room over the Post Office on Front Street in a building owned by Lillian Close. The library was run by Mrs. Close, Phoebe Halverson, Elma Galvin and Ellen Ainslie. The Alamo School hosted a county library in 1917 and the Alamo Community Club fitted part of the Hoover building with library books in 1922. Miss Ida Hall supervised and many of the books were provided by the Hemme sisters of Berkeley and Martha Bunce Mougin (from the Stone family collection). delightful, sunny and large enough for a few years..”. San Ramon’s libraries began in 1919 at the San Ramon Grammar School and continued in the San Ramon Store owned by Annie L. Fry. After Mrs. Fry passed away in 1929, a Mrs. DuBois was librarian for two years. For a time it was housed in Mrs. Victoria Soto’s home on a book shelf. Ann Kaplan remembers the Soto library at the corner of Thorup Lane and today’s San Ramon Valley Blvd. “She had a couple hundred books in her living room and she let people check them out.” Her son Bill Soto recalls this as well and still has this original San Ramon library book case. The country library time line indicates that the San Ramon Library ended in 1933, with the supposition that San Ramon readers began to use the Legion Hall library. At the Danville Legion Hall library, Mrs. Clark was librarian for 20 years, followed by Mrs. Myrtle Osborn (1945) and Mrs. Grace Warren (1956) with Mrs. Osborn continuing as assistant for many years. Young Winky Camacho worked part time at this library beginning in 1956 and said it was a tiny room with storage in the bathroom. Mrs. Warren got boxes from Elliott’s Bar and used them for book storage. Gary Soto and Barbara Park recall this library and the stereopticon on one table -- an early form of multi-media. After the freeway was completed through the valley in 1966, the area’s population exploded. The San Ramon Valley Library League lobbied for a new library which was built Danville in 1961. The San Ramon Valley Public Library opened on June 12, 1961. Called “space age” in design, it was very modern, with soaring glass windows at one end. San Ramon opened a new library at 100 Montgomery Rd. in 1989 just six years after the community incorporated. Then a new Danville Library was established in 1996, replacing the 35-year old San Ramon Valley library. In 2005 the Dougherty Station Library opened, serving the growing Dougherty Valley residents. The Danville Library will have a special Centennial Celebration on Saturday, November 9. Don’t miss the Danville Library Timeline with photographs of early libraries and librarians, now on display. Jones, Virgie V., Historical Persons and Places…in San Ramon Valley, 1977. News Notes of California Libraries, April 1926, page 137. Bill Soto, Gary Soto, Barbara Parks.